The Neapolitan Mastiff is a serious, powerful dog. 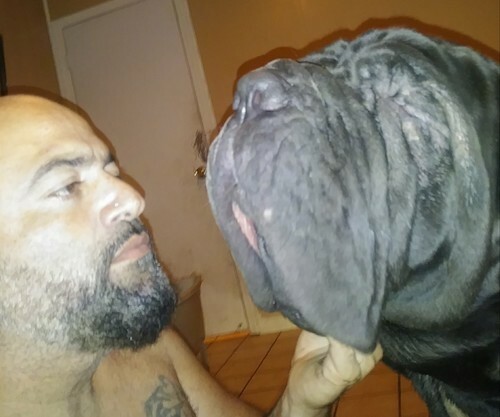 The body of this massive, rather rectangular looking dog has abundant, hanging wrinkles and folds on the head and a very large dewlap. The wide, flat head is large in comparison to the rest of the body. 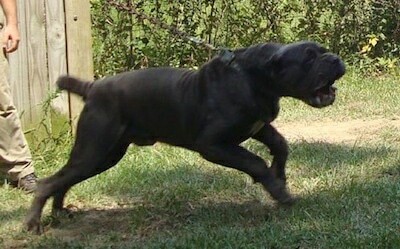 The muzzle is 1/3 the length of the head and is as broad as it is long with a well-defined stop. The large nose has well-open nostrils and a color that coordinates with the coat. The teeth meet in a scissors, pincer or slight undershot bite. The deep-set eyes are almost covered by the dropping upper lids and come in amber to brown, depending on the coat color. Puppies begin life with blue eyes, which later darken. The ears may be cropped or left natural. Many owners opt out of docking and cropping, preferring the natural look, as it is painful for the dog. The tail is carried straight up and curves over the back. In dogs that are shown in the AKC front dewclaws are not removed. The round feet are large with well-arched toes. The straight, dense, short coat comes in gray, blue, black, chocolate, mahogany and tawny, sometimes with brindle and white markings. A little white is permitted on the chest and toes. No white should be on the face. Chocolate dogs are rare. 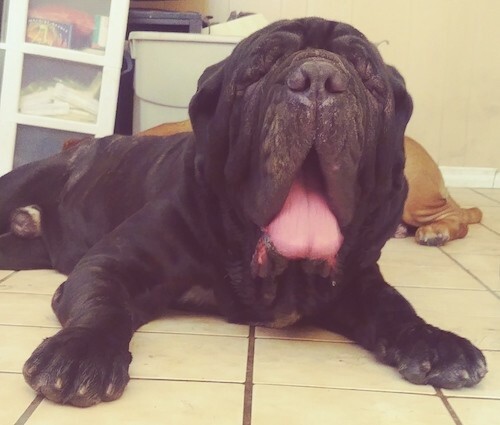 The Neapolitan Mastiff is not a breed for everyone. This breed looks a bit intimidating, but is actually affectionate, calm, peaceful and loving. They enjoy family and friends. This breed is a heavy drooler, particularly in hot weather or after getting a drink. Males may drool more than females. They are very keen to their owners’ commands. Intelligent, very protective, courageous, serious and mild-mannered. Generally quiet, they tend to only bark when necessary. They can be reserved with strangers; socialize them well with people, places, sounds and animals. These dogs are usually very loving with children, provided the children know how to display leadership skills. A Neo can get along well with non-canine pets if raised with them from puppyhood and/or properly socialized. Obedience training is very important. Teach them to heel on a lead and to go in and out door and gateways after the humans. This breed needs a dominant owner who understands and is capable of controlling them properly. They will be easiest if this is established when the dog is still a puppy, but it is still possible to communicate with an adult Neo that the human is in charge. Children should be taught how to be pack leaders. Socialize this breed while they are young. This is a natural guard dog and protection training is not necessary. You cannot breed out the guard in the dog, no matter how submissive they become. If they sense there is a threat to the home they will react unless the owner is there and tells them everything is OK. Be sure you are consistent in approach and do not keep repeating commands the dog has failed to obey. If they are not listening, try a different approach, making sure you are in a confident state of mind. Neos will not listen to meek owners. These are not dogs for beginners, but it is an exaggeration to describe them as difficult in their association with others. A calm handler with natural leadership will achieve the best results. 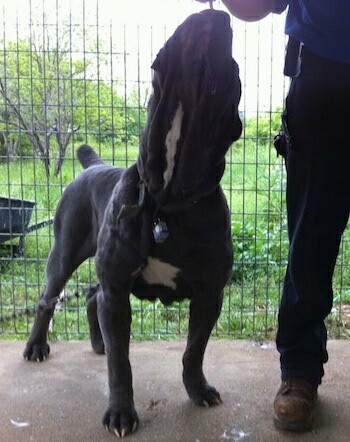 With comprehensive training and an experienced, dominant owner, the Neapolitan Mastiff can be a wonderful family pet. This breed has a high pain tolerance. Neos that do not have a firm, confident, consistent owner who provides them with daily pack walks to release mental and physical exercise will become willful, over-protective and dog aggressive. When correcting this dog, the owner's correction must match the dog's level of intensity, and the timing of the correction must be precise. Prone to cherry eye, hip dysplasia, bloat, pano-ostiosis (joint pain from growth can occur at 4-18 months and usually goes away on its own). Pups are usually born via caesarian section. The Neo will do okay in an apartment if it is sufficiently exercised. It is relatively inactive indoors and a small yard will do. Take extra caution in warm weather to provide shade, water and a cool place to lie. 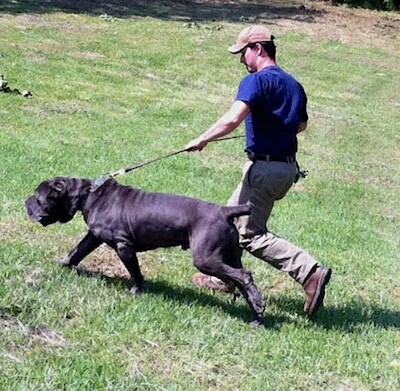 Adult Neapolitan Mastiffs need a great deal of exercise. They should be taken on daily, long walks at least twice a day. While out on the walk the dog must be made to heel beside or behind the person holding the lead, as in a dog's mind the leader leads the way, and that leader needs to be the human. Teach your dog to enter and exit all door and gateways after the human. These giant, shorthaired dogs are easy to groom. Remove loose, dead hair with a rubber brush. This breed is an average shedder. All European mastiffs are descended from the Tibetan Mastiff, the most ancient member of the canine species. The first Asian mastiffs were probably brought to Greece from India by Alexander the Great around 300 BC. The Greeks introduced the dogs to the Romans, who adopted them enthusiastically and used them in circus combats. The word "mastiff" derives from the Latin word “masssivus,” meaning massive. English experts, however, have another theory. They contend that the mastiff was brought to Britain by the Phoenicians in about 500 BC and spread from there to the rest of Europe. 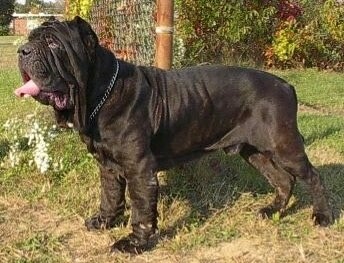 In any case, the Neapolitan Mastiff is a direct descendant of the Roman Molossus. While the breed became extinct throughout the rest of Europe, it continued to survive in Campania, despite the perils of weather and war. 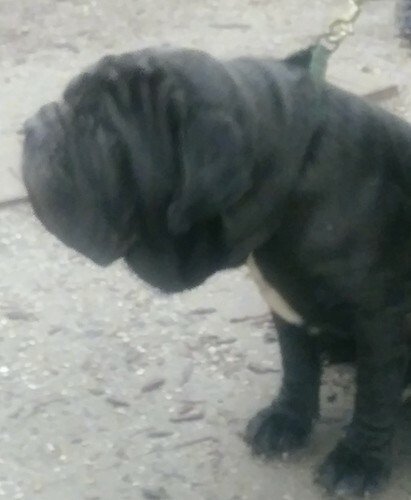 One can therefore say that the Neapolitan Mastiff has existed in Campania for two thousand years, even though it was not officially recognized until 1946, and its standard was not set until 1949. The Neapolitan Mastiff was bred for use in war and in bloody Roman arena spectacles. Today this powerful breed has a well-deserved reputation as a formidable guard dog. 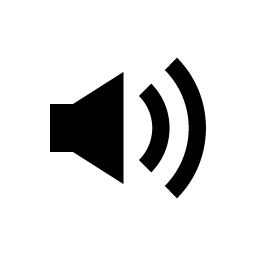 Neos have been used by the Italian police and army and by that country's farmers, business establishment and estate owners to protect people and property. Though the Neapolitan Mastiff was first shown in Italy in 1946, the breed is still quite rare in the United States. 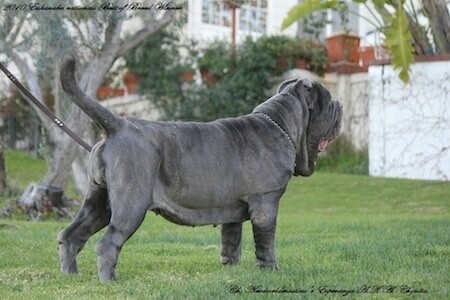 The Neapolitan Mastiff was recognized by the AKC in 2004. 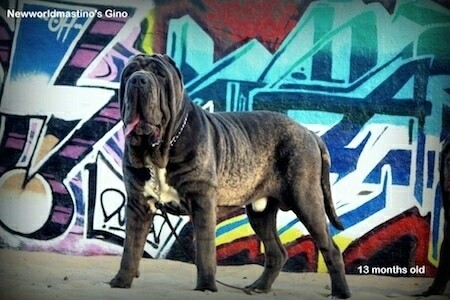 Newworldmastino's Gino the Neapolitan Mastiff at 13 months old—"Newworldmastino's Gino is third generation. My bloodlines go back to world Ch. Brigante del Castellaccio and Dello Stradone bloodlines, Gino only needs 3 points to be a champion; not bad for a young male." Ch. 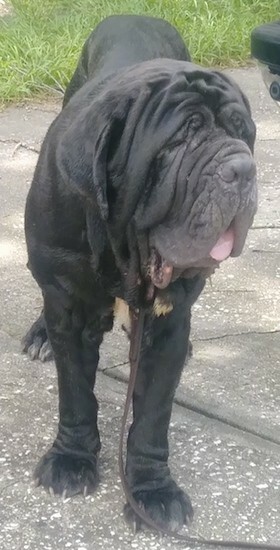 Newworldmastino's Esperanza AKA Chiquita at 4 years old—"Chiquita is the only female Neapolitan Mastiff to ever win Best of breed at the Eukanuba nationals; she beat males and females alike in the 2010 Eukanuba nationals." 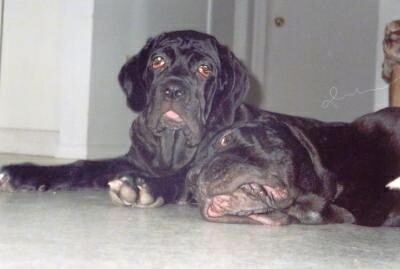 Two Neapolitan Mastiff puppies—Posh is up and Argus is lying down.